Gamru Rag Rugs: Gamru Rag Rugs - The Process..
Gamru Rag Rugs - The Process..
Gamru Rag Rugs has approximately 20 ladies making shaggy rag rugs entirely by hand. 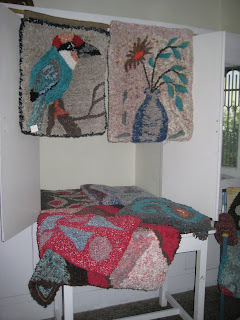 All the rugs take several weeks to produce, working just an hour or two each day. 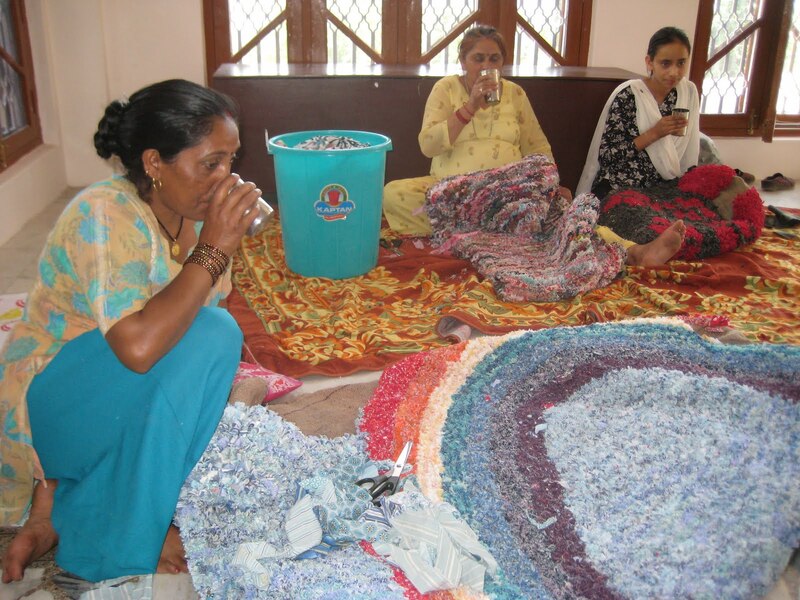 Scrap fabric, normally discarded and burned, is donated by a local tailoring company (Himalaya Tailoring Centre). After collection the scrap fabric is sorted into some sort of order. This is quite labour intensive and not a favourite part of the process for the ladies. 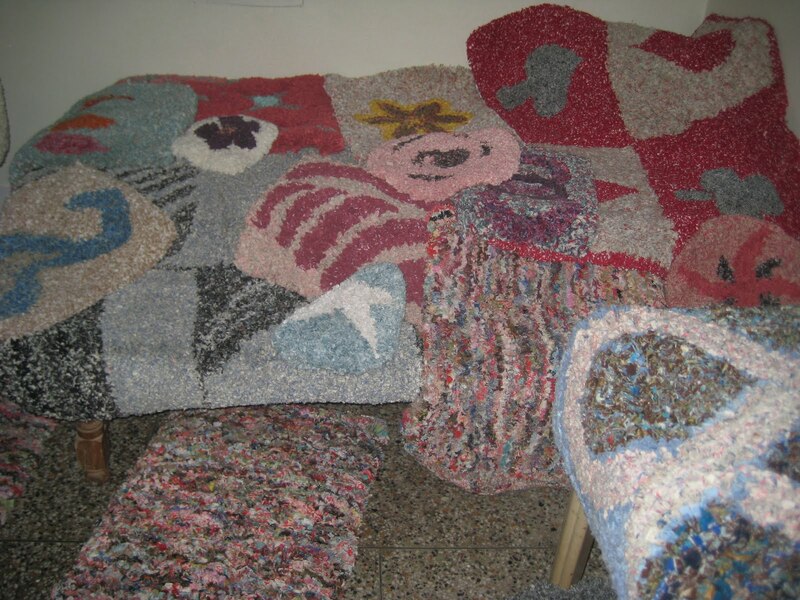 However this part of the process is necessary in order to enable us to create designs, which are dependent on the colour and amount of the various scrap fabrics we have. 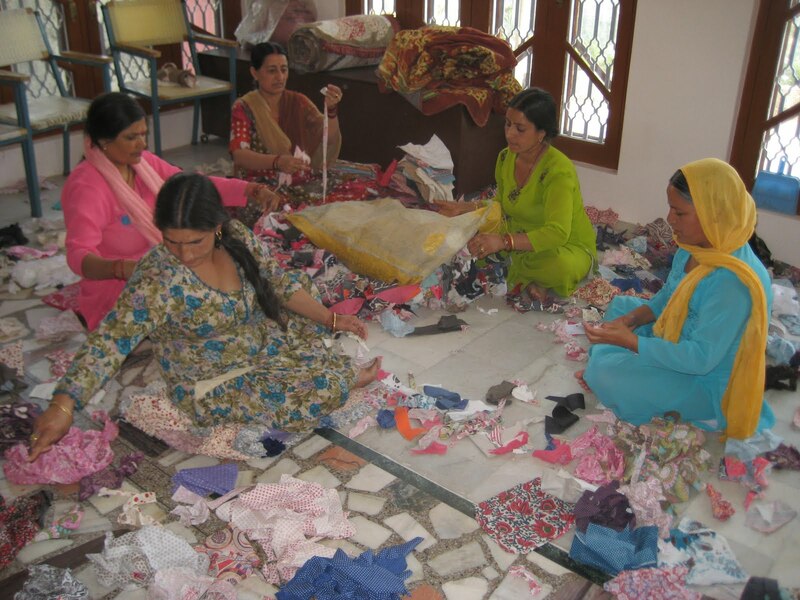 Pictured sorting fabric, clockwise from Left: Nimmo, Usha, Subhadra, Sonia, Bindhra. Used hessian (jute) rice or grain sacks are used as a base for the rugs. 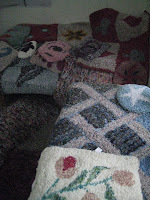 These have been donated to us by a local general store. 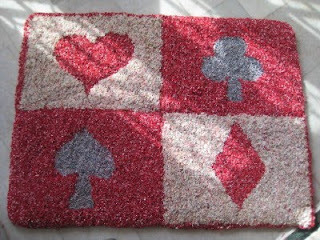 The sacks are thoroughly scrubbed with hot water and detergent prior to use to ensure not only that they are clean, but because the printed / dyed writing on the sacks can bleed into the finished rug when washed. Designs are then drawn onto the sacking with permanent markers, colours chosen and the women start to work. 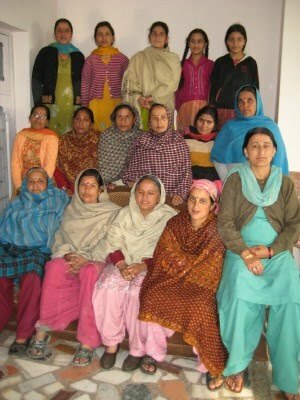 From Left, Meena, Perkasi and Anjelie (Perkasi`s daughter) take a well earned break. 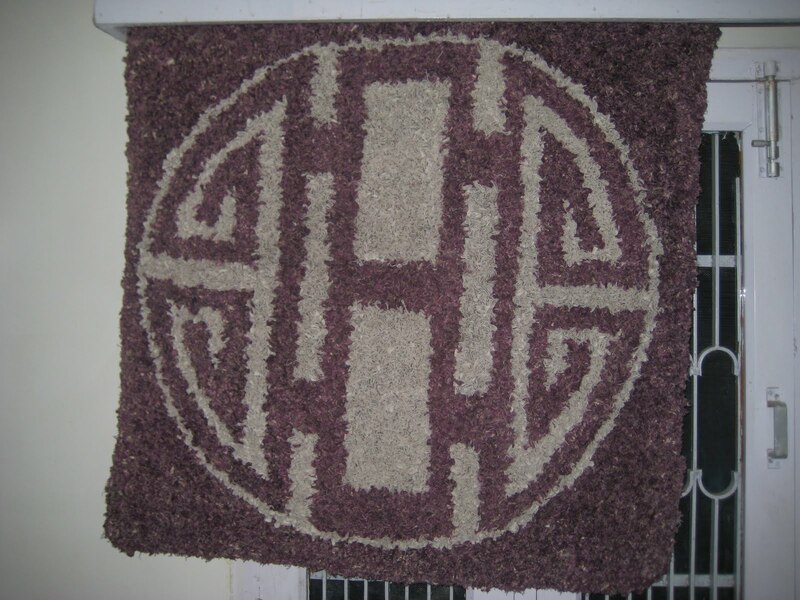 It is difficult to believe that the end product is entirely made from what would otherwise be relegated to the garbage. Pictured below are some of the completed rugs we have here at the moment. 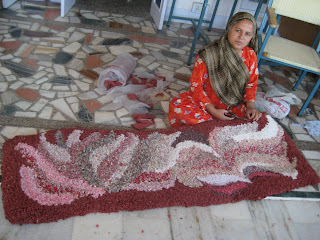 This is Bindhra finishing off her latest rug - a hall or bedside runner. 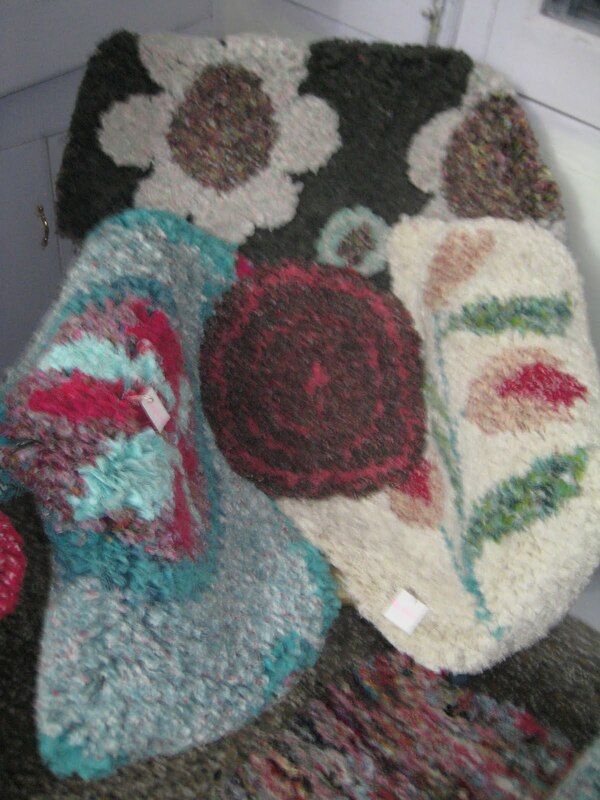 This rug measures 178 x 55cms. The rug has taken approx 120hrs to complete..